How does cosmopolitanism fare as an innovative practical philosophy with a claim to be particularly germane to contemporary problems? More particularly, what does the discourse of cosmopolitan justice contribute to the case that cosmopolitanism is sufficiently different to merit our attention as a new approach within political philosophy, and can this contribution survive critical scrutiny? This chapter seeks to answer these questions principally in relation to that school of contemporary cosmopolitanism which operates within a largely Rawlsian framework and seeks to extend the approach to justice deployed by John Rawls within the confines of the nation-state and apply it, as Rawls did not, to global or transnational spheres. 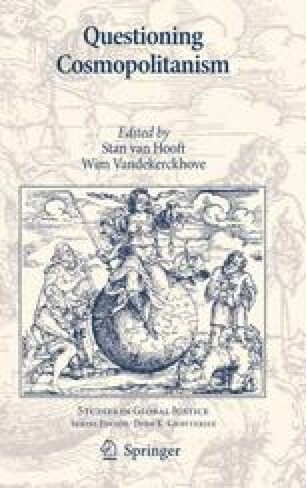 I argue that this project has the initial advantage of marking out a potentially distinctive feature of cosmopolitan theory, something which is lacking in many of the more abstract attempts to define cosmopolitanism, but I go on to question whether it is justice (in contrast, for instance, to humanity) that should be the prime moral basis for establishing morally acceptable institutional arrangements that affect the production and distribution of goods on a global basis. I conclude that it is a theoretical and perhaps practical mistake for cosmopolitans to put so much emphasis on what might be called the globalization of justice as distinct from the globalization of morality more generally.